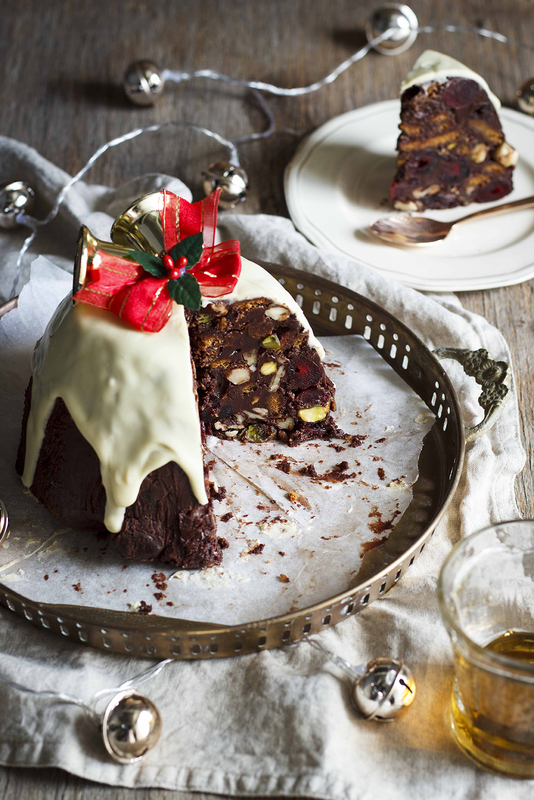 Does anyone actually LIKE Christmas pudding? 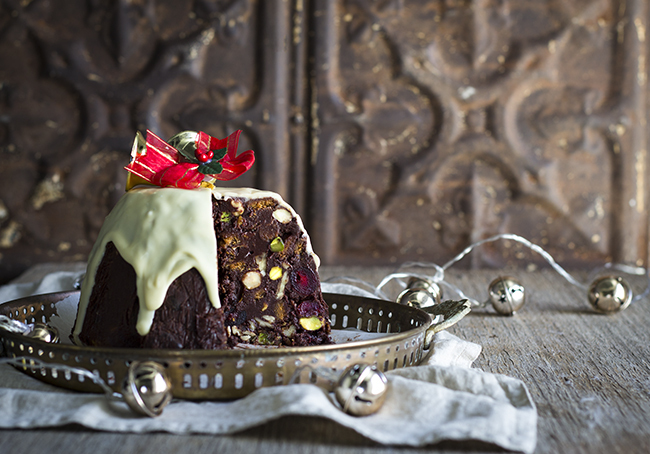 Sure, it wouldn’t be Christmas without it, but in our hot South African climate, who wants to eat a heavy, steamy, piping hot custard-coated winter pudding? Bleh. Yes, our Christmas is peppered with all kinds of snow-covered European traditions but that doesn’t mean we can’t put our own twist on them. Forget reindeer – we should have springbok instead! But let me not get ahead of myself here, let’s start with the important stuff; dessert. 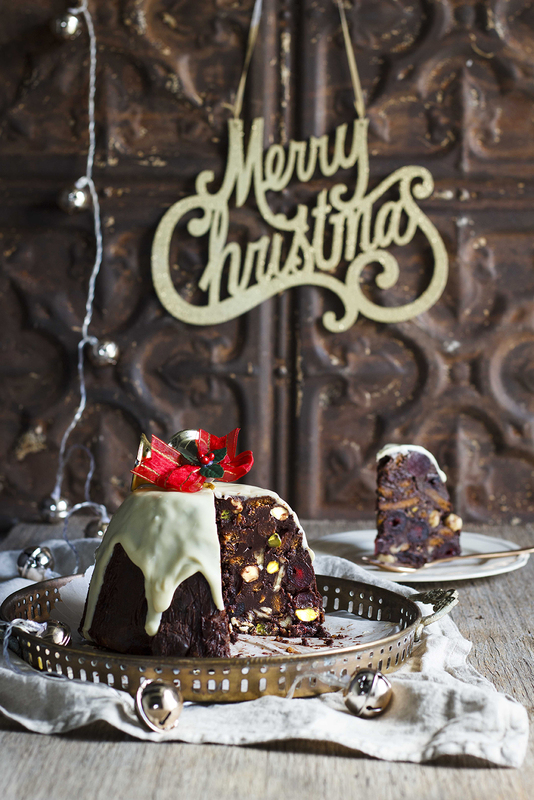 Looks like a figgy pudding – yes! 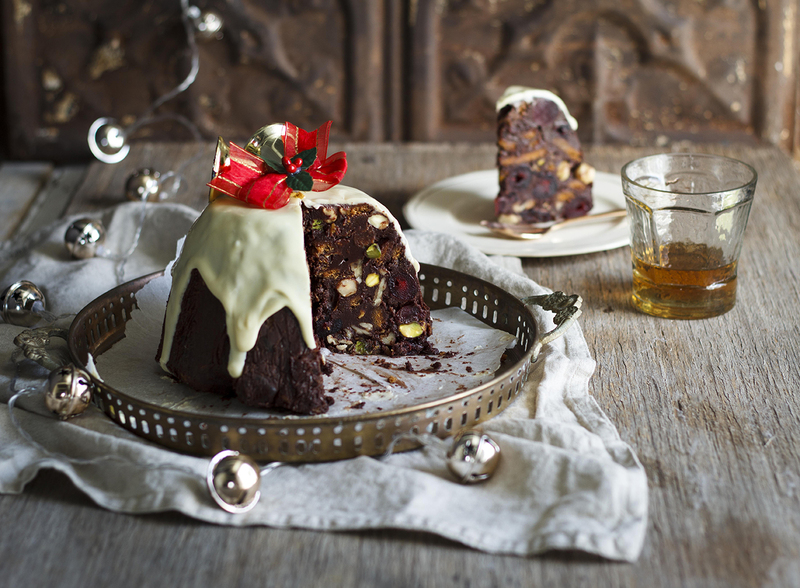 Tastes like a figgy pudding? Well, erm no. It’s a gajillion times better! Firstly – it has chocolate in it. 5) You can put whatever the heck you want in it! 6) It’s low-fat – JOKES! Oh heck no. Hear that? It’s the sound of diets crashing everywhere! But hey, that’s what January is for, right?! Now, you might be thinking, this looks familiar. Remember my Peppermint Crisp Fridge Cake recipe? 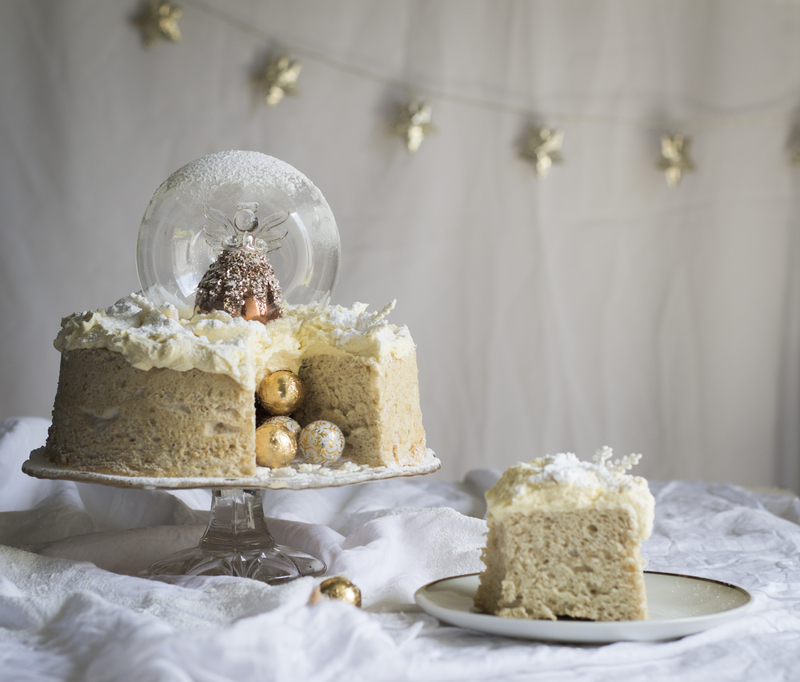 In celebration of it being shared over 21 500 times on Facebook (see there are LOTS of sugar addicts out there like us) I gave it a festive makeover with an unhealthy amount of Christmas cheer (and treats)! I’ve added ginger biscuits, cherries, pistachios, toasted hazelnuts, candied peel, dried figs, booze-soaked raisins, heck I even threw in some spices and drenched it in white chocolate. 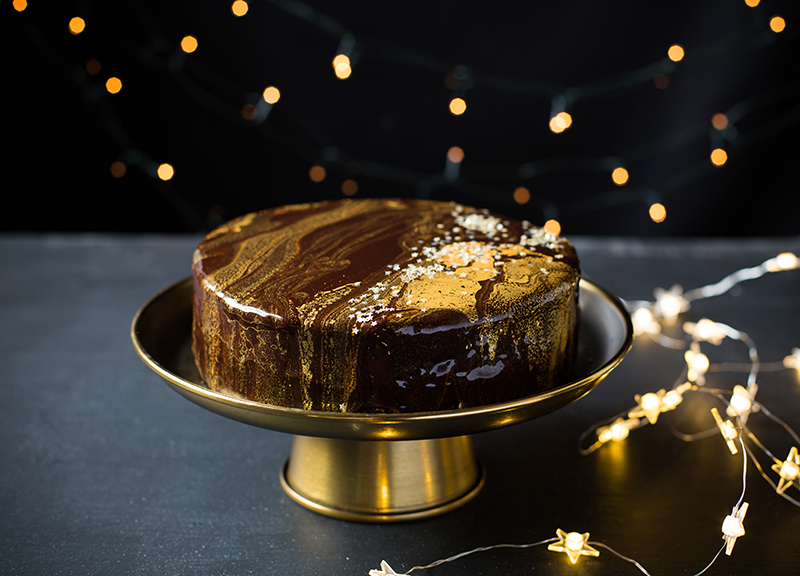 It’s like a Christmas party – in your mouth! But also, it’s muesli. Start by lining the inside of a medium-sized 1.5L mixing bowl with 2-3 layers of clingwrap. In a saucepan, combine the butter, milk chocolate and condensed milk over low heat and stir until melted. In a separate bowl, mix together the spice, biscuits, nuts and fruit. Stir into the chocolate mixture and mix well. Pour into the lined mixing bowl then place in the refrigerator for 2-3 hours or until set. Remove from the mould and turn onto a serving plate. Spoon the melted chocolate onto the top and coax it down the sides. 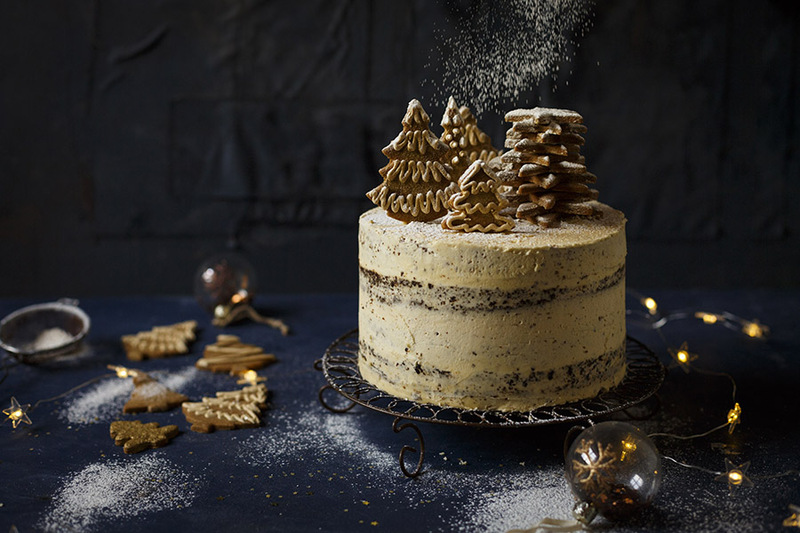 Decorate with sprinkles or Christmas decorations. Serve thin slices with strong coffee or a glass of brandy.